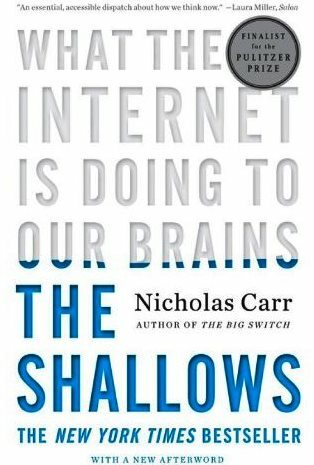 Nicholas Carr's The Shallows: What the Internet is Doing to Our Brains (New York: W. W. Norton & Company, 2011 paperback edition). Well, how's your noodle holding up inside the electronic envelope? Has the internet made mush of your attention span and ability to think deeply? These are essential questions raised and explored by Nicholas Carr, using Marshall McLuhan as a jumping off point. "The Net has become my all-purpose medium, the conduit for most of the information that flows through my eyes and ears and into my mind," Carr notes on page 6. He cites a study that observed how many people don't read in a traditional way, but rather "skip around, scanning for pertinent information of interest" (page 9). This is how I seek out "news" and "updates," certainly, though I read books, longer articles and poetry in basically the same "left to right" manner that I've done since childhood, regardless of format (that is, I do this with both printed materials and digitized etexts). Also, I make sure to take plenty of time away from "the madding crowd" -- online or in my actual 3D physical space -- for deep reading, contemplation, writing, connecting, thinking, or zoning out. How about you? How about people born within the digital age? To be continued: No sense in making this post any longer or heavier: online readers tend to devote only about ten seconds per webpage and read (or skim) only about 18% of content, missing or ignoring 82% of the rest (page 135). Still, thanks for reading even that much. I start normally at about 2 AM and will stay on line until no later than 8-then that's it for the day. In that 6 hours i read through somewhere like 3=5 news sites and as you know often write lengthy derogatory comments to and about the governor, mayor and any one else who is stealing this state from us. FB and the rest 8meh* i will go through it, sometimes use it like a phone but for the most part i have seen enough cat photos to last me awhile. I read web pages and info like everyone else in the digital age. Btu like you I still read printed material, or e-material on my kindle in the same old fashioned way. My brain has been rewired somewhat by the internet, although, like you, I try to mitigate this by taking time away and consciously reading longer paper-based works. I find that I tend to write shorter pieces, as well as read shorter ones. Attention span? Oh, look! A squirrel! I have written a lot about this topic in the blog. A lazy brain gets lazy to settle to the internet facilities. On the other hand, who always liked to read properly, you will have a recipe for good reading. Intelligence tells us that we can only select what is best for us, everywhere we walk. Nicholas Carr's is right to observe the different way we read online. Our eyes go faster around the screen than the paper pages. Addict look is the same as addicted brain, so always look for places where the virtual does not reach not to let my brain virtualized.